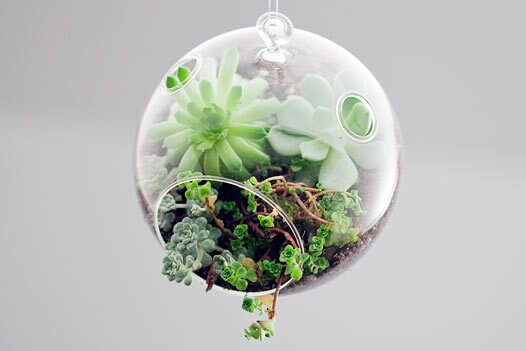 Their beauty, health benefits and ease of care have brought terrariums back to the forefront of home décor and gift giving. 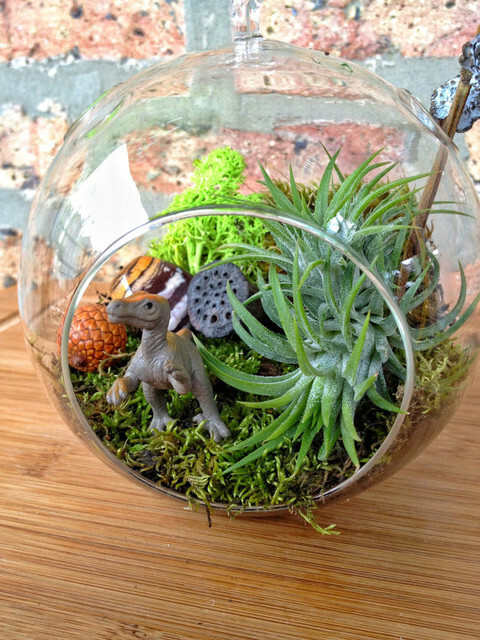 From a thank you gift to an activity for the family, terrariums are an affordable way to bring the outdoors in, anytime of year. You can use small containers, such as glass butter dishes, brandy snifters and mason jars or large, towering glass spheres for a dramatic floor or table centerpiece terrarium. They require very little care so they can be well maintained in a cubicle, small dorm room or other low-light area that could use the health and aesthetic benefits that plants offer. To create the base of most terrariums, put down a layer of small pebbles mixed with charcoal chips and cover that with Spanish moss before finally covering that with soil. 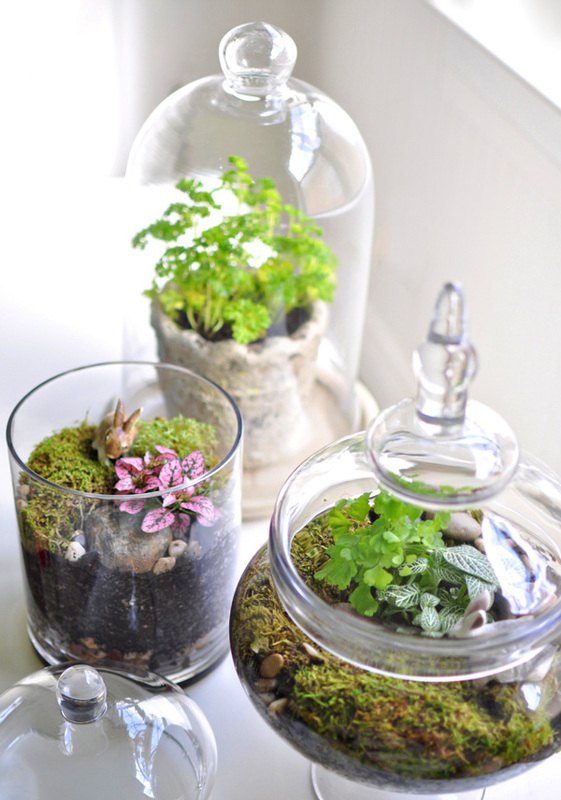 Add plants of varying color and height and spritz to complete a basic terrarium. Here are five ways to add a personal touch. IG Tip: if there is no condensation on the glass, spritz the plants, but otherwise be careful not to overwater. Open the terrarium to air it out every so often. 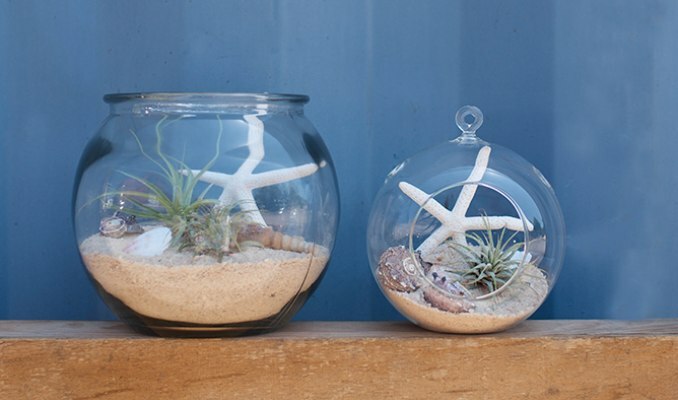 Provide a personal thank you to a friend with a terrarium filled with friendly plants. The deeply textured pattern on the thick, two-toned leaves of the Moon Valley Friendship plant can be placed at the center of a terrarium scene for a striking focal point. Its delicate pink flowers will look distinguished against a blanket of golden clubmoss or clover. 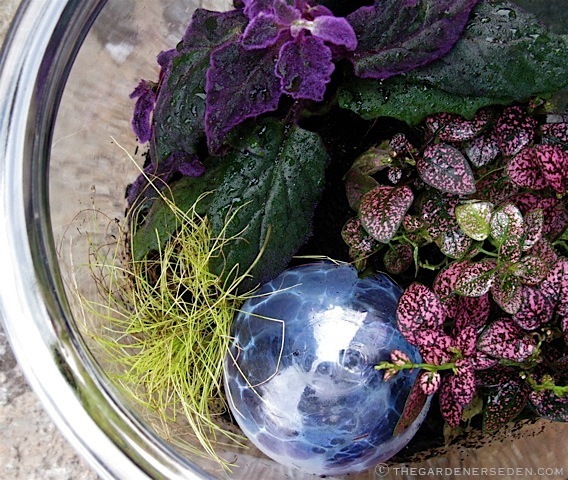 Gather the kids together to create a terrarium that will grow and change as they do. Add hermit crabs or small turtles to make a living landscape. Or you can add a tiny house and glass bead path for a fairy woodland theme. Dinosaurs hiding among the foliage or climbing rocks can be an inspiration for an imaginative child. The striking slender pale green leaves of the air plant can easily represent beach grass for a coastal-themed terrarium. The blue, purple or pink tubed flowers lend a soft color to your beach world inside a globe. Add sand instead of soil for a clean look and top with seashells, bits of opaque glass beads or a tiny chair to complete the look. The glossy leaves of the variegated spider fern provides a glow to a terrarium built around a holiday theme. You can present favored trinkets from generations past surrounded by sweet baby’s breath for a sentimental display or gather modern ornaments with spiky air plants for a contemporary centerpiece. The hens and chicks succulent is a symbol of strength and translates into “live forever.” Plant this in a mound surrounded by anemone, which means health and healing, for a thoughtful gift of good health. Add striking glass beads for a pop of surprise color. If you have any questions about terrariums or if you would like some tips on creating the perfect indoor garden connect with our experts at Interior Gardens. We would love to help you find the best plants for your home or office and assist you in transforming your space with professional plant design.